Crywank started in 2009 with James Clayton attempting to do some folk-punk influenced acoustic music with no previous experience playing guitar. The first album "James is going to die soon" was inspired by a painful break up. James stated that "I wrote these songs out of frustration and sadness and they ended up making me feel a lot better, I hope they have a similar effect on you". In 2012 Crywank released his second album 'Narcissist On The Verge Of A Nervous Breakdown'. Described as "a collection of paranoid songs mostly about me trying to understand my own sadness along with the concept of sadness as a whole. It was fueled by self help books and pot." 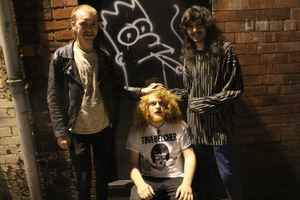 In late 2012 Dan Watson joined Crywank on percussion, and in early 2013 they released tour demos for their third album 'Tomorrow Is Nearly Yesterday And Everyday Is Stupid' which was released in October 2013. In 2014 Tom Connolly joined on bass, Crywank is now a full band. James continues solo recordings under the name JC and The Nobodies . The name Crywank comes from a nickname a friend gave James due to his over-the-top displays of sadness. His Mum tells her friends he's called 'Tearjerk'.